Each dungeon has several rooms. To enter a room, you must have enough stamina, with each room listing its required stamina, along with the amount of battles inside. Upon completing a dungeon for the first time you will receive a gem. You can replay cleared dungeons and still collect monsters and coins, but you won't get any further gems. OneDungeon's innovative battle system is likely something you've not encountered before. "But wait, isn't this basically another match-3 game?" you shout. The answer? "No, definitely not!" While you must match up 3 or more of the same type of piece (Yes, just like other match-3 games), you are free to move your pieces to any position on the board rather than simply one space, all in a single turn. When doing so, your piece will swap positions with the piece whose spot you moved into. This is how your monsters attack, by matching three or more pieces of a color, you will cause your monsters of that color to attack. The larger the number of pieces you match, and the amount of combos you create, the higher the amount of damage you will do to your opponent. See those reds at the top, 3 columns in? I want to move my other red to match those up vertically. This is entirely doable in a single move. Once I move my red to the right, the blue piece will switch into the red's place. Clicking and dragging my red to the right caused the red and blue to switch positions, now while still holding my piece, I will move it up one space to create the line I need to attack. 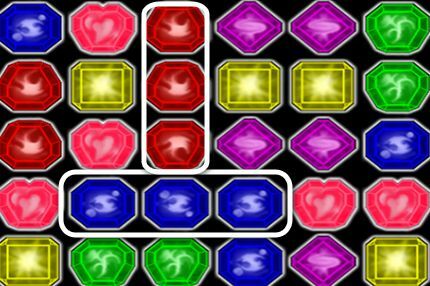 Just like last time, moving my red will cause the blue piece to switch into the incoming piece's position. After moving my piece, now look! We've not only matched up the reds, but during our movements, we caused some blues to switch around and create a second line. We did all of this in a single turn, unlike other match-3 games where you are only able to move one space at a time. This allows you to create massive combos provided you're fast enough and plan your moves accordingly. After grabbing a piece, you have a 2 second countdown in which to move your piece, so it's advisable to plan and co-ordinate your moves first, as there's no time limit between taking your turns. 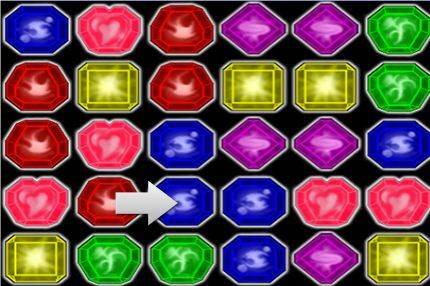 Healing works the same way as attacking, except you must match pink pieces. The more pieces you match, the larger the amount of HP you recover. During battle you can also target specific enemies by clicking on them. This can be useful for directing your attacks towards enemies who may be about to attack you! You can stop targeting an enemy by clicking on them again. 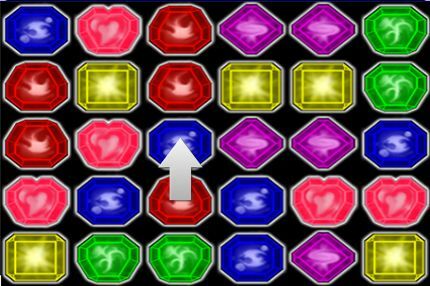 The icon above an enemy's head indicates how many turns remaining before they will attack. When this number reaches 0, the enemy will attack and the counter will reset. During your battle you will collect coins and sometimes monsters. These are only placed in your inventory if you clear the dungeon. If you die, you will have the choice to either revive using a gem and continue fighting, or leave the dungeon. Leaving the dungeon will mean that you lose any pickups from that dungeon along with any EXP you or your monsters would have gained.